What is the Cattle Council Referendum? 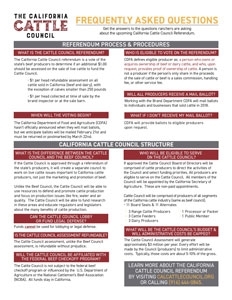 The California Cattle Council referendum is a vote of the state’s beef producers to determine if an additional $1.00 should be assessed on the sale of live cattle to fund the Cattle Council. • $1 per head collected at time of sale by the brand inspector or at the sale barn. What is the difference between the Cattle Council and the Beef Council? If the Cattle Council is approved through a referendum of the state’s producers, it will create a separate council to work on live cattle issues important to California cattle producers, not just the marketing and promotion of beef. Unlike the Beef Council, the Cattle Council will be able to use resources to defend and promote cattle production and focus on production issues like fire, water and air quality. The Cattle Council will be able to fund research in these areas and educate regulators and legislators about the many benefits of cattle production. Who is eligible to vote on the referendum? CDFA defines eligible producer as: a person who owns or acquires ownership of beef or dairy cattle, and who, upon request, provides proof of ownership of cattle. A person is not a producer if the person’s only share in the proceeds of the sale of cattle or beef is a sales commission, handling fee, or other service fee. Will all producers receive a ballot in the mail? CDFA will mail ballots to individuals and businesses that sold cattle in 2018. What if my don’t receive my ballot in the mail? Call the California Cattlemen’s Association at (916) 444-0845 or Western United Dairymen at (209) 527-6453. CDFA will provide ballots to eligible producers upon request. Download a provisional ballot here. Who will be eligible to serve on the Cattle Council? If approved, the Cattle Council Board of Directors will be comprised of cattle producers to direct the activities of the Council and select funding priorities. All producers are eligible to serve on the Cattle Council. All members of the Council will be appointed by the California Secretary of Agriculture. These are non-paid appointments. The Cattle Council will be comprised of producers representing all segments of the California cattle industry (same as Beef Council). When will the voting begin? The voting period, begins on February 21, 2019 and runs through March 22, 2019. All ballots must be postmarked or otherwise received by the California Department of Food and Agriculture (CDFA) no later than March 22, 2019. Can the California Cattle Council Lobby of Fund Legal Defense? Funds cannot be used for lobbying or legal defense. Is the California Cattle Council Assessment Refundable? The Cattle Council assessment, unlike the Beef Council assessment, is refundable without prejudice. Will the California Cattle Council Be Affiliated with the Federal Beef Checkoff Program? The Cattle Council is not subject to the federal beef checkoff program or influenced by the U.S. Department of Agriculture or the National Cattlemen’s Beef Association (NCBA). All funds stay in California. Who will be Eligible to Serve on the California Cattle Council? If approved the Cattle Council Board of Directors will be comprised of cattle producers to direct the activities of the Council and select funding priorities. All producers are eligible to serve on the Cattle Council. All members of the Council will be appointed by the California Secretary of Agriculture. These are non-paid appointments. The Cattle Council will be comprised of producers of all segments of the California cattle industry (same as beef council). What will be the Cattle Council’s Budget and will Administrative Costs be Capped? The Cattle Council Assessment will generate approximately $3 million per year. Every effort will be made by the Council (producers) to limit administrative costs. Typically, those costs are about 5-10% of the gross. LEARN MORE FROM the California Dept. of Food and Ag.